Official SliTaz GNU/Linux Raspberry Pi model 1 distribution, a small operating system for a small computer! The goal is to provide a fast, minimal footprint and optimized distro for the Raspberry Pi. You can setup a wide range of system types, from servers to desktops and learning platforms. Check out our PiBook to get started with your Raspberry Pi and SliTaz. SliTaz Raspberry Pi actually provides a text mode base system and a light desktop flavor powered by JWM and the FOX toolkit. Download the tarball, extract, install and boot your Raspberry Pi! For now the only installation option is to have 3 partitions on the SD card then run the install.sh script from a Linux system. In time we will try to provide a disk image for MS Windows and OSX users. Raspbian users can install a debian package built with this shell script. SliTaz will share the Raspbian partition or run in memory only. SliTaz Raspberry Pi provides a CGI SHell remote control environment with custom plugins. Creating new plugins is a nice way to learn CGI/SHell scripts and Linux commands. SliTaz Raspberry Pi can also be controlled via the cmdline and an encrypted SSH connection. 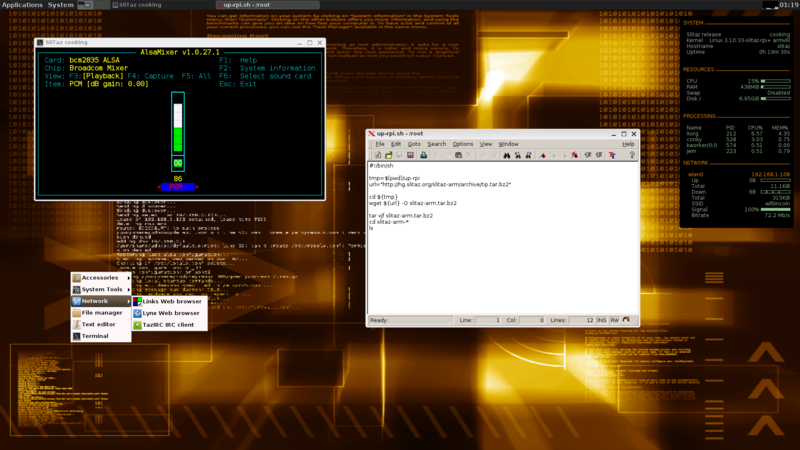 Finally, you can also control a SliTaz Pi desktop graphically with a VNC viewer. Check out the: PiBook Remote control section for more information. By default SliTaz Raspberry Pi provides some tiny and low footprint servers and some additional services can be installed via the Spk packages manager. Installed servers are ftpd, httpd, tftpd, ntpd, udhcpd and the Dropbear SSH server. MPD, the best audio server is also on the mirror. PiBook - Read our SliTaz Raspberry Pi Pocket Book for suggested usage and setup guides.